It's too late to save Lake Winnipeg from an infestation of zebra mussels, a water scientist says. It's too late now to save Lake Winnipeg from an infestation of zebra mussels, a Manitoba water scientist says. The small, filter-feeding mussels, which reproduce aggressively, were first spotted in Lake Winnipeg's algae-ridden waters in October 2013. Despite efforts by the Manitoba government to control the problem, in part by dumping tonnes of liquid potash into the lake last year, the invasive species has become prolific. "It's beyond the point now of being able to do anything at all about it," said Eva Pip, a University of Winnipeg biologist who studies water quality and Manitoba's lakes and rivers. "Even last year, we were already beyond that point when we were dumping those chemicals into an already polluted lake." While Minister of Conservation and Water stewardship Tom Nevakshonoff agrees fixing the problem "is not an easy task by any means," he still believes things haven't yet gone past the point of no return. "I would disagree there is nothing we can do — we are doing a lot already and we can do more," Nevakshonoff said. "The most important message is what every Manitoban can do, because this is a collective effort... we all have to prevent zebra mussels everywhere." The province says "significant numbers" of zebra mussels have been found on moored boats, along beaches and on buoys, docks and ladders in the lake's south basin. Manitoba Conservation said Thursday that zebra mussels have been found as far north as near Matheson Island, as well as in the Hecla area and south of Grindstone Point. Nevakshonoff estimates it could cost the province $138 million to turn back the clock on zebra mussels, which are also in the Red River. Some have been spotted at Manitoba Hydro's Selkirk generating station and at the St. Andrews lock and dam, according to the province. Pip said zebra mussels will choke out everything else in a lake because they reproduce so quickly, with millions of mussels forming carpets on the bottoms of boats and along lake bottoms. "In the Great Lakes there are zebra mussels that are literally metres thick, and it makes the beaches unusable because those shells are very sharp — they're literally like shards of glass, so you can't walk on them barefoot," she said. "And then, of course, the ecosystem collapses because they have such a high filtration rate. They're filter feeders, so they will filter out the food that is necessary for the other organisms to survive." Zebra mussels have an impact on the fishery and tourism, she added. Pip said the province was warned years ago, long before zebra mussels appeared in the water, that it had to do something about the invasive species. No one believed it was a problem back then, she said. "This wasn't taken seriously enough, and this is how we seem to react to every environmental crisis here — that we don't have a problem. Our reaction is, 'Why should we worry when we don't have the problem?'" she said. "Then when we do have the problem, well, then it's like, 'Well, who knew?' Well, we did know, but we couldn't get, you know, the people who were in charge to do something more aggressively about it." 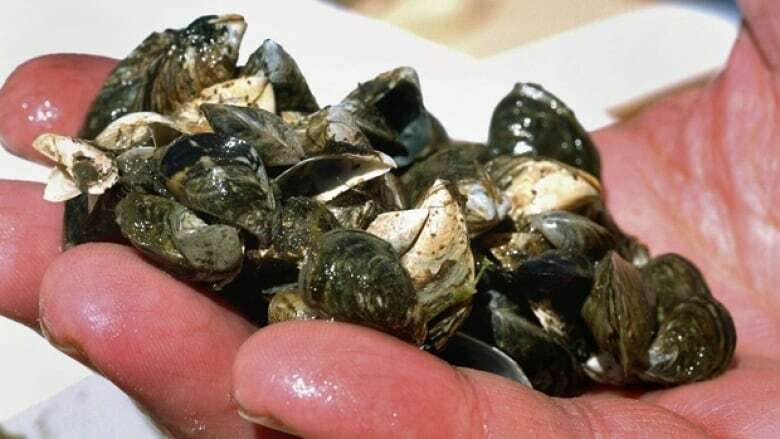 By the time the provincial government "cottoned on to the problem," the zebra mussel infestation was already on both sides of Lake Winnipeg's south basin, Pip said. Despite the resurgence of zebra mussels following the potash dump last year, the minister doesn't think it was a complete waste of money. "We did successfully eliminate them temporarily in that area. The fact that they have recovered so quickly is just an indicator how pervasive and invasive a species we're are dealing with here," said Nevakshonoff. "I would not want to try and understate the magnitude of the problem." The best that can be done now, Pip said, is to keep zebra mussels from spreading into other waterways — a priority shared by Nevakshonoff and the province.